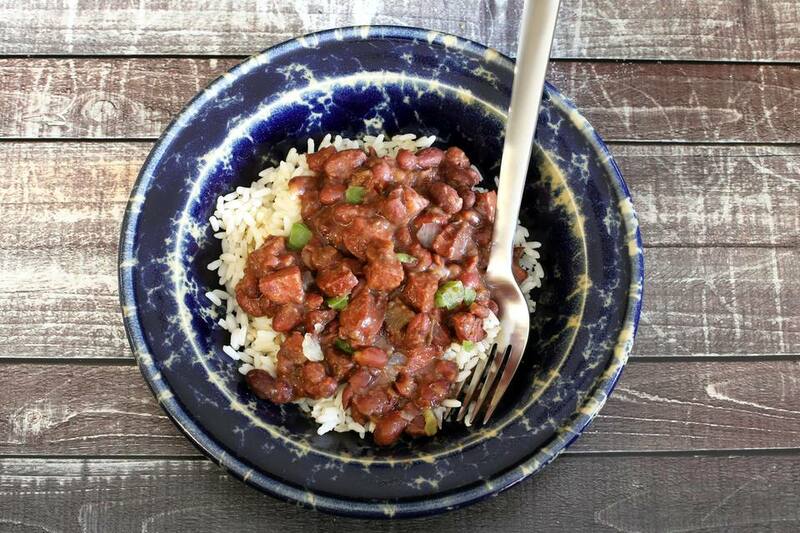 Spicy andouille sausage jazzes up this basic crockpot red beans and rice recipe. If you like a meatier red beans and rice, add a ham bone, ham hocks, diced ham, or some bacon to the beans. Red beans and rice is a traditional Louisiana dish. You'll find similar dishes in many regions. Hoppin' John is a Southern dish made with black-eyed peas and rice and "Moors and Christians," or black beans and rice is a traditional Cuban dish. Limpin' Susan is another bean and rice dish similar to Hoppin' John, but it's made with okra and bacon and it doesn't always include beans. Some versions include black-eyed peas or red beans. Some people have no problem adding the salt and other acidic ingredients with dry beans, and others say the age of the beans or water hardness can cause problems. Because salt and acidity—for some people—can keep the beans from becoming tender, add the salt and sausage after the beans have become tender. Put the dried beans in a bowl of cold water and swish them around to rinse. Discard floating beans. Drain the beans in a colander and pick them over, looking for any small stones or malformed beans. Put the beans in the crockery insert of a slow cooker. Add 1 1/2 quarts of water to the beans along with the celery, onion, ​garlic, bay leaves, and crushed red pepper flakes. Cover the slow cooker and cook the beans on LOW for about 6 to 7 hours, or until the beans are tender. Or cook them for about 3 1/2 to 5 hours on HIGH. Heat the vegetable oil in a skillet over medium heat. Add the diced andouille sausage and cook, stirring, until the sausage is nicely browned. Add the sausage and bell pepper to the beans. Taste and add 2 to 3 teaspoons of Kosher salt, or to taste. Cover and continue cooking on LOW for about 1 hour longer. Meanwhile, cook the rice in a rice cooker or on the stovetop following package directions. Mound the rice on a plate or in a bowl, ladle the beans over the rice, and serve with freshly baked cornbread. To freeze leftovers, chill the cooked red beans and sausage and pack into freezer containers. Leave about 1/2-inch of headspace to allow for expansion. Use diced kielbasa or another type of smoked sausage in place of the andouille. Add 1 chopped carrot along with the onion and celery.